"I want to apply for job X, but I don't meet selection criteria 3. How should I apply?" 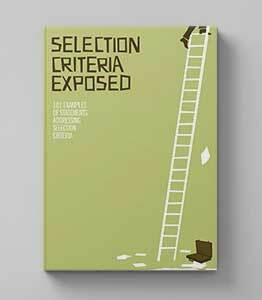 "I want to apply for job X, but I don't have experience with the software asked for in the selection criteria. What do I do?" My immediate gut reaction is to say, if you don't meet all of the selection criteria you shouldn't waste your time on a job application. But sometimes it's not as clear cut as that. "Demonstrated ability to adhere to an appropriate and effective set of core values and act in line with those values. This one is a doozy, Vanessa. Whose core values are they talking about? Appropriate to whom?" This is not only a terrible selection criterion for an applicant to have to address, but it's also a tricky one for a selection panel to assess. It's very vague and there are no guidelines. Find out what the core values are that the organisation abides by or has published. Ask the contact officer if you can't find them yourself. Find out as much as you can about the job and how the selection criterion in question might fit into the duties of the position. Show how you have done something similar in the past. Show how you have learned something similar in the past. Give examples of how you are able to pick up the skills / knowledge / experience you are missing in a very quick timeframe. State that there will be a limited training liability on part of the organisation if you are successful gaining the position. Yes, your chances are going to be lower if you don't meet all of the criteria, but what if there are only a few applicants, and no one meets all the selection criteria? 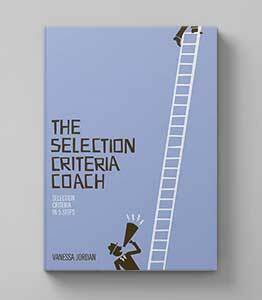 Even better if you can address the selection criterion in a way that shows that you will be able to pick up the skills / knowledge / experience you are missing in a very quick time frame with a limited training liability. (This is a fictional application for someone applying for a position at the Australian Taxation Office). Demonstrated ability to adhere to an appropriate and effective set of core values and act in line with those values. maintain public trust in the APS. My employer, (Company), has a set of values and standards that form the basis of business success. The values and standards inspire trust and confidence on the part of our employees, our customers, our suppliers, and our shareholders. The underpinning of the values and standards is that all business stakeholders are entitled to know about our business practices, and the company’s employees deserve to be treated equitably and will respect. Like many companies, (Company) has devised a ‘decision test’ that I apply to all of my work decisions. The Decision Test is a set of criteria to help determine the appropriate course of action and involves asking the following questions. Is the action legally permissible? Does it comply with the company’s standards and policies? Does it involve any inequitable or dis-respectful actions? How would it look in the newspaper? Would you be confident explaining it to the regulator? I believe this decision test can be applied to any work in any occupation, including public servants working in the Commonwealth Government. The answers and outcomes achieved from the decision test are in-line with the Australian Taxation Office’s set of core values, with the exception of ‘focus on achieving results and managing performance’, which I uphold in my day to day work by striving hard to accomplish my best and go beyond anticipated expectations whenever I can. If I am successful in the position there will be a limited training liability in terms of adering to an appropriate and effective set of core values as demonstrated by my previous experience. 1. Find out as much as you can about the job and how the selection criterion in question might fit into the duties of the position. Use the job description and talk to the contact officer. Inserting these findings into your written application will show the selection panel that you have a good understanding of what the job entails, how your skills fit in, and that you understand your limitations. 2. If you are allowing the selection panel to see some limitations in your skill set, you need to immediately follow this with examples of how you will overcome your limitations. This can include researching what training is available (or commencing some training is even better), researching the topic to show a growing knowledge base, speaking to people in similar positions to see how they have gained their skills and abilities. 3. Show how you have learned something similar in the past. Outline specific examples of what you have learned and how. 4. Give examples of how you are able to pick up and learn the skills / knowledge / experience you are missing in a very quick timeframe. 5. State that there will be a limited training liability on part of the organisation if you are successful gaining the position.